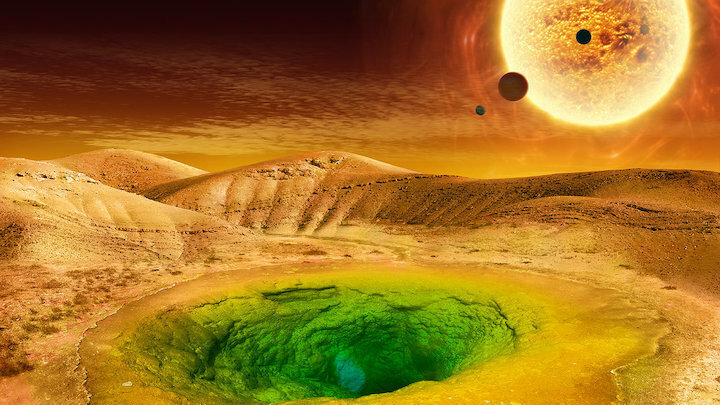 Artist's visualization of what a distant, alien planet could look like. What are the chances it develops intelligent life? Paul Sutter is an astrophysicist at The Ohio State University and the chief scientist at COSI science center. Sutter is also host of "Ask a Spaceman" and "Space Radio" and leads AstroTours around the world. Sutter contributed this article to Space.com's Expert Voices: Op-Ed & Insights. For the precocious hunter of off-Earth life, the Drake equation is the ever-ready, go-to toolkit for estimating just how (not) lonely humans are in the Milky Way galaxy. The equation was developed by astronomer Frank Drake in 1961 in a slight hurry so that attendees of an upcoming conference would have something to confer about, and it breaks down the daunting question "Are we alone?" into more manageable, bite-size chunks. The equation starts with some straightforward concepts, such as the rate of star formation and the fraction of stars hosting planets. But it quickly moves into tricky terrain, asking for numbers like what fraction of those planets that could host life actually end up evolving intelligent species and what fraction of those planets blast out friendly signals into the cosmos, inviting us Earthlings to a nice little chat. The end result is supposed to be a single value (or, at worst, a range of values) that predicts the total number of intelligent and conversation-ready species in the galaxy. And if that seems a little unsettlingly bold, then at the very least, the Drake Equation serves as a philosophical device for instigating conversation. It also frames a proper scientific discussion about the ultimate question of finding and talking to alien species in the galaxy. Except that it fails on both counts. The Drake equation is simple, but deceptively so. Frank's original recipe had only seven ingredients, and further enhancements from other researchers haven't drastically changed that number. So, you might naively think you need only measure or guess a heavy handful of parameters and you're good to go. But reality isn't that simple. Estimates and measurements always have uncertainties. This concept is absolutely critical for scientific inquiry: What you know is far less important than how well you know it. The real meat of any scientific discussion is digging into the uncertainties and how they're estimated. To justify a bold claim, you need a very tight knowledge of the uncertainty. And to overthrow the claim, you don't have to attack it directly; you can simply call into question a statement's precision. For the Drake equation, we simply have no idea about the uncertainties attached to any of the parameters. What fraction of planets where life could get started eventually develop life? Zero percent? 100 percent? Somewhere in between? Is it 50 percent plus or minus 5 percent? Or plus or minus 25 percent? Or plus 5 percent and minus 25 percent? And it takes only one unknown uncertainty to sink the whole enterprise. You may chip away at the Drake equation over the course of decades, taking careful observation after careful observation, measuring star-formation rates, hunting for liquid water on planetary surfaces, the works. You may think you're making good progress on nailing down this prediction, but as long as a single parameter still has unknown uncertainty, you haven't made any progress. That single unknown can undo the hard work poured into the entirety of the rest of the equation. Until you know all of it, you know none of it. Every few months, a new paper involving some variant of the Drake equation claims to put some "reasonable" estimates on the parameters and produce an answer. Sometimes, the papers claim that the galaxy is teeming with thousands of intelligent civilizations. Sometimes, the research says we're completely alone. When Drake and colleagues first turned the crank, they tossed out estimates of anywhere between 1,000 and 100,000,000 such civilizations. That's … not very helpful. The Drake equation is simply a way of chopping up our ignorance, stuffing it into a mathematical meat grinder and making a sausage-guess. It doesn't have any predictive power greater than randomly pulling a number out of a hat. What if you didn't accurately estimate one of your uncertainties? The answer isn't reliable. What if you missed a parameter, some crucial element in the steps from stars to sentience? The answer isn't reliable. What if you had too many parameters, introducing an element that turned out not to matter? The answer isn't reliable. The Drake equation makes a significant number of assumptions, and until those assumptions are verified, we can't trust the calculation's results. OK, we can't treat the Drake equation as a physics equation; that is, we can't use it the same way we can handily use something like Newton's second lawor the equations from general relativity or Maxwell's equations for electromagnetism. That's fine. Perhaps the Drake equation's power is more as a philosophical treatment, to help guide our thinking and help us navigate the murky waters of a deep and fundamental existential question. But what is the utility of introducing the Drake equation into such philosophical discussions? Do we really advance or sharpen our thinking? What is the advantage to replacing one big unknowable (the number of intelligent species Out There) with many smaller unknowables that aren’t easier to solve? Yes, breaking down a big problem into smaller ones is a common tactic in science. But that only works if the smaller problems are all individually easier to tackle. There's a risk we will spend more time unhelpfully discussing the parameters of the model and less time gainfully trying to go out there and actually search for life. Debating over the particular value of, say, the number of life-bearing planets that will give rise to intelligence (a number which must be 100 percent made up) will not give us a clearer picture of the chances of chatting with another intelligent species — instead, we just end up clouding our perspective through an intrinsically warped formulation. There are, today, ongoing searches to hunt for life outside the Earth. Planned missions to sample the icy moons of the outer worlds, moons which harbor vast liquid water oceans. Exoplanet hunters developing the technology to tease out the hints of biosignatures in alien worlds. Did the Drake equation, in any of its formulations, help frame or advance or assist those missions? While the Drake equation may have spurred the early scientific discussion of the search for extraterrestrial intelligence, it doesn't have much value beyond that. We can't use to it further our understanding, and we can't use it to properly guide our thinking. The huge uncertainties in the parameters, the unknown ways those uncertainties mix, and the absolute lack of any guidance in even choosing those parameters robs it of any predictive power. Prediction is at the heart of science. Prediction is what makes an idea useful. And if an idea isn’t useful, why keep it around?